The guy was dressed in working attire, complete with a tie, in a pair of orange boots sitting by the pavement by a busy road. I moved on since I initially thought it was some flyer distribution gimmick but there were similar guys situated all around the area. They were pretty difficult to miss and I was totally intrigued with what’s the entire concept all about. I spotted the Twitter handle @The_OfficeGuy and decided to look him up. So, the Twitter profile and the timeline did not say much about him. I dropped him a @mention and he introduced himself the same as in his profile. That made me wonder – if this is supposedly a promotional campaign (and I was pretty sure it is), why isn’t he promoting a single bit on the product / service? After observing the timeline for about a week now, @The_OfficeGuy is all about running contests and replying @mentions. At this stage, I was determined to uncover this ‘mystery’ of @The_OfficeGuy. 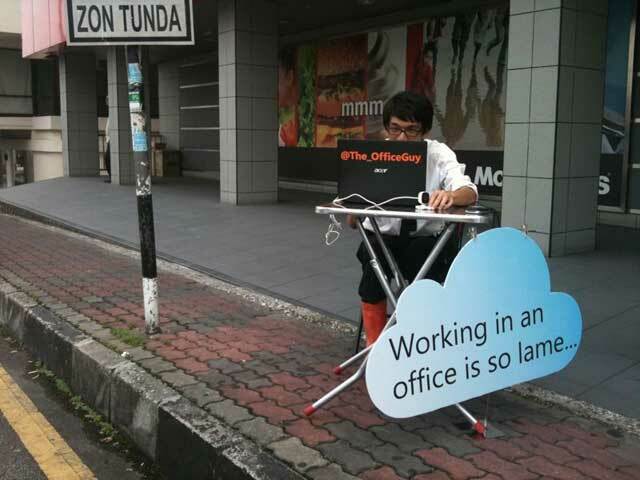 After several searches I found that it is actually a campaign by Microsoft – promoting their cloud solutions (that’s why the cloud is there) such as Office 365. It is a good idea to use social media platforms to drive conversations for your offline promotional campaigns. The reason is simple: you get people talking – especially if the campaign actually DO drive conversations! Why not bring the conversations online in which you too, can respond to them? 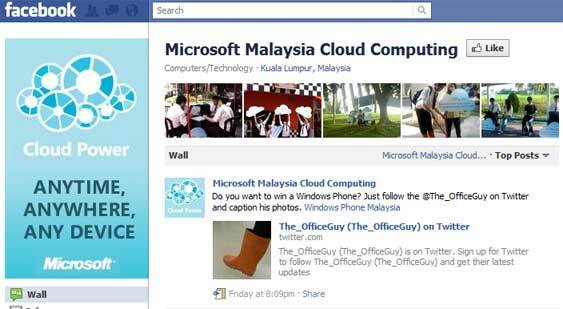 Microsoft managed to put a ‘face’ and a real-life scenario to its cloud solutions. This way, the promotion takes a more human and conversational approach without being in-your-face. Consumers had it enough when it comes to blatant advertising. 1. People somewhat know that this IS a campaign. So why follow an advertisement channel? 2. All it does is to talk, talk and talk. What can I get out of listening to his conversations with others? 3. (Referring to the Twitter profile) What value can I get out of the misadventures of someone? I can’t argue it’s capabilities in drawing curiosity and responses but if you can’t keep the consumers, you’re merely a shopfront display. It may be more effective if there is a balance between the tweets – engagement vs providing value. You do not need to sell your product, but cleverly picking out its benefits and usage in an educational tone will do better. There’s no need for expensive print advertisements. If your business has a targeted audience in a specific geographical area or even with limited budget, you may want to consider narrowing your promotional focus such as Microsoft. Concentrate on one location to build visibility and utilize social media platforms for engagement to take place. Your business may be the next talk of the town! What do you think about the campaign? Are there areas that you think they’ve done well? Is there anything lacking? I agree that they did a good job of gaining your attention but their follow-up was horrible. The fact that you had to spend time trying to find out who he was, why he was doing it and so forth was a complete failure on the campaign. It’s great that they got your attention/curiosity but if you can’t hold it and give people a reason to stick around, the message will just get lost. Well said, Alan. They could have at least have a platform to gather all curious cats (like myself) and unveil the true identity of @the_officeguy when the time is right IF they were thinking of keeping it mysterious. That way, they can also build their database and identify who is interested and also measure the success of the campaign. It is just as you said – they gave no reason to stick around. Following them on Twitter did not bring value which leaves only 1 thing to do next – forget about them.